My house projects are temporarily on hold, because I can't find the paint for the cabinets. Also, I got a signed contract for a commission, so I have to be working on that. Naturally, though, all I really want to work on right now is my CoCo gala dress, because I figured out my design! I'm really excited about it. 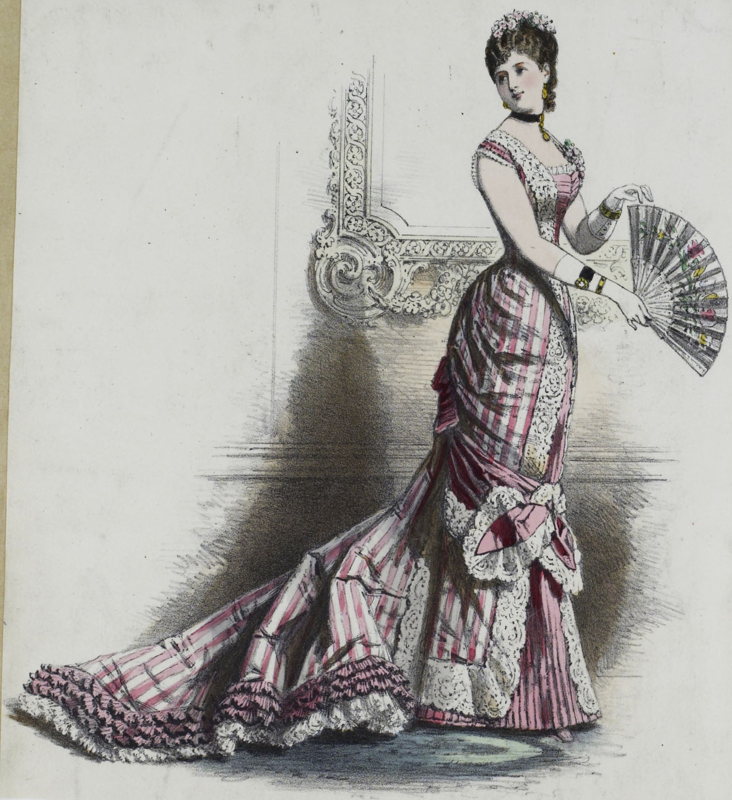 I'm going to do a natural form 1879 dress based off a fashion plate I've been eyeing for a while. I'm fairly certain I'm going to make it a princess dress, since that's what I originally thought the plate was, though sewtimely noticed there is actually a waist seam. In between the commission work, I'm going to play around with some patterning, and see what I like better. 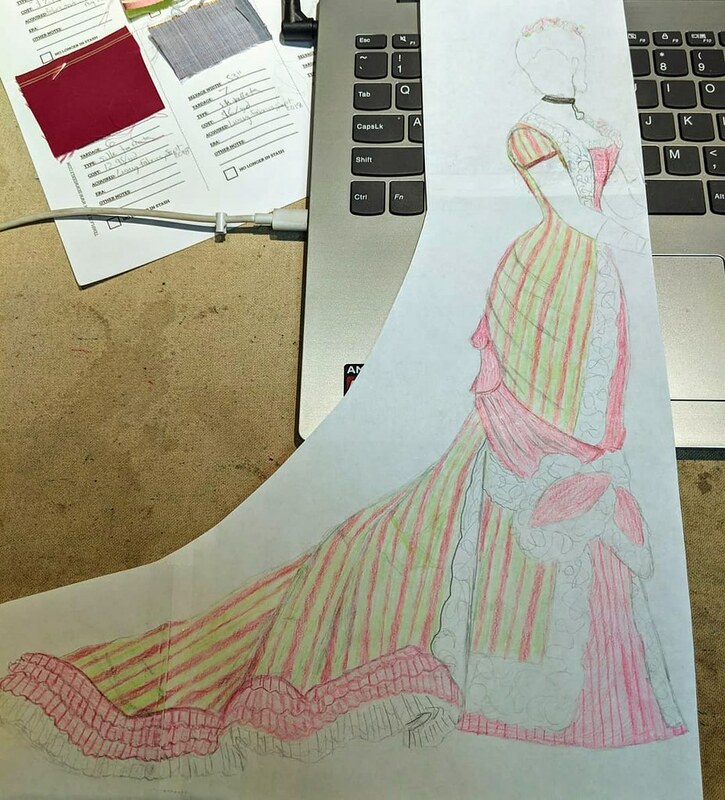 I have to find some long pieces I can use for mockup fabric, but I already have the green/pink satin/taffeta stripe, and the pink taffeta, both of which I bought in September at Luxury Fabrics in LA. I'm hoping to find some nice wide lace online, and I'm also trying to figure out what I might have to do for the understructure. I ordered some more garment bags on Amazon prime, and they should be arriving by tonight, so I think I can even move a bit more in to the closet, though I have a feeling I'll wind up needing to get even more bags. I'm probably going to leave most of the silk and possibly the wool things inside, and put everything else out in the outside closet. Also, anything that is too long for a 72" garment bag will have to stay inside, too. I can't wait to have more room in my coat and bedroom closets, and be able to get the garage a bit more organized. My next project will be a quick jaunt back to sewing - I have to get estimates done for two commissions, plus I'm making my mom's birthday present (which is a tool roll-up for her glass tools). And then I'm back to house stuff, painting the 5 lower cabinet doors for my kitchen, installing a new shelf/towel bar in the bathroom, and (hopefully) figuring out my leaky faucet. That one still seems really daunting! I got some done on my house projects this weekend. Namely, my friend's husband came over on Saturday with a chain saw and helped hack up the trunk/base branches of the giant shrub on the side of my house, so that is now gone! Or rather, it is a stump, and about 4 branches that didn't fit in my yard waste bin this week. The branches will go in next week, and I will either live with the stump, or eventually decide to dig it out. But this means I can get to my gutters! So that will be one of the next things on my list, when it stops raining. I have to clean the gutters on that side, mow both lawns, and shape the rest of my hedges. And I found 4-5 gutter guards left over from when I did the back of the house, so I can go ahead and put those up while I'm at it. In the meantime, while it's raining, I have my indoor projects! The closet has definitely climbed to the top of the list. Unfortunately, I had to return some of the things I bought from Lowes, because it turns out that not only can they not cut closet rods, they can't even cut closet shelves! When I called Home Depot, they said they could, so I am going to stop there after work today, buy two shelves and get them cut, and probably buy rods from them, too, if they can cut them. Otherwise, I guess I have to go with the extendable metal rods. I also have to get screws so I can put the brackets up. The shelf unit that had been "built in" to the workshop was actually only screwed in to the wall with one screw, and it is super flimsy when it's not leaning on the wall on one side. So I'm going to put that out at the street and hope that someone takes it, so that I don't have to dismantle it. I might get a cubby or shelf unit eventually, but I have a plastic drawer set that I will put in there for now. I'm just excited to get the bar and shelves hung! Because I knew this would happen, I am probably going to work on the closet before the two more important projects. Last night, I went in and cleaned off most of the workbench, including killing the biggest spider ever. I sprayed him with poison, he pretended to die for like 10 mins, and I thought all was well. Then I hear a tapping noise behind me, and it's because this humongous spider has come back to life and was so large that his feet were literally making tapping noises on the wood as he walked. Gross! So I sprayed him with a lot more poison, and before he could come back to life again, I used one of those claw extended reach things to squish him with a piece of poison soaked cardboard (that had been to near to the spider to remove from the workbench in the first place). Then I threw a tissue over him, and picked him up within the tissue using the claw grabber, deposited him in a trash can, and then squished him with the claw some more. I just needed to make sure he was really dead. So anyway, the workbench can now be removed. Though I am kind of paranoid that I'm going to run into another spider! And last night, I ordered hopefully all the closet supplies I will need, though I know that's a little premature. But I got brackets, shelves, and rods. It will wind up being kind of walk-in closet style, with a rod on either side of the entrance. In the back center, I hope to have some sort of shelving unit that can also act as a desk, because I want to see if the room would also work to do voiceover in. There is a shelving unit currently in the storage room, that were presumably built by whomever built the workbench, so I'm hoping that I can maybe just move that, since it would save me from dismantling it. I'm still trying to figure out lighting. Right now I have one of those clamp-on ikea desk lights in there, but I'd rather have something with a bit more even light. The problem is that the only plugs come from a surge protector that has been mounted on the wall by the door. Anyway, I'm hoping to have a little time tomorrow to start dismantling the workbench, though I also need to take a little time today or tomorrow to do yard work as well. 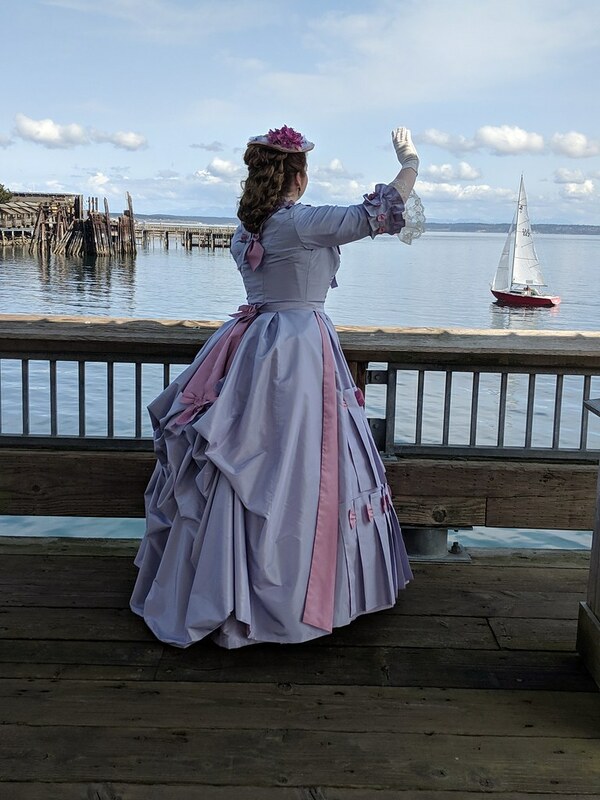 I'm still editing pictures from the three costume events I attended in March (the Outlander Ball, Emerald City Comicon, and the Victorian Festival). I've been posting some pictures from all three on instagram, and once I finish editing, I'll try to do a little picture post of each of the first two events on here. I still never finished painting my cabinet doors and drawers from my kitchen, which I started and abandoned back in Dec 2015. My goal for this project is to get the 5 lower cabinet doors painted, plus at least two drawers (I've become used to using the drawer spaces as shelves, so I plan to continue doing that for two of the four existing spaces). I want to shape all the shrubs in my front yard. They were nice little round things when I moved in. Now they're pretty huge. I'm almost done with removing the giant shrub on my side yard, though - all I have left are the thicker base branches, which I will need someone with a chainsaw to help me.I'm hoping that I can still get my ladder up even with the base branches there, though, because that means I can finally clean the gutter on that side of the house (and probably install some gutter guards). The project that I'm most excited for, though, is revamping the storage closet area in my garage. It was built as a workroom, with a waist-high workbench on two walls, and shelves on the third wall. I'm going to remove the workbench and set it up as a closet! It already has actual dry-walled finished walls, so I think it's pretty well-sealed. I would love to be able to put up actual closet rods, and hang all the costumes in garment bags, but if I can't figure that out, I will get another ikea wardrobe, and move my existing one in there, too. I'm even wondering if I can set up a little space in there to do voiceover work. I've been wanting to get into that for a long time, but haven't had a space available for it. So anyway, there really won't be any sewing updates for the next month or so, other than a commission I might have, but I will be posting about housy stuff here! Port Townsend was lovely! I didn't wind up finishing 100%, but I got about 98.5% done, so I was still happy. I didn't make the belt, for example, but I made the bow that goes on the belt, so I just pinned that onto my skirt waistband. 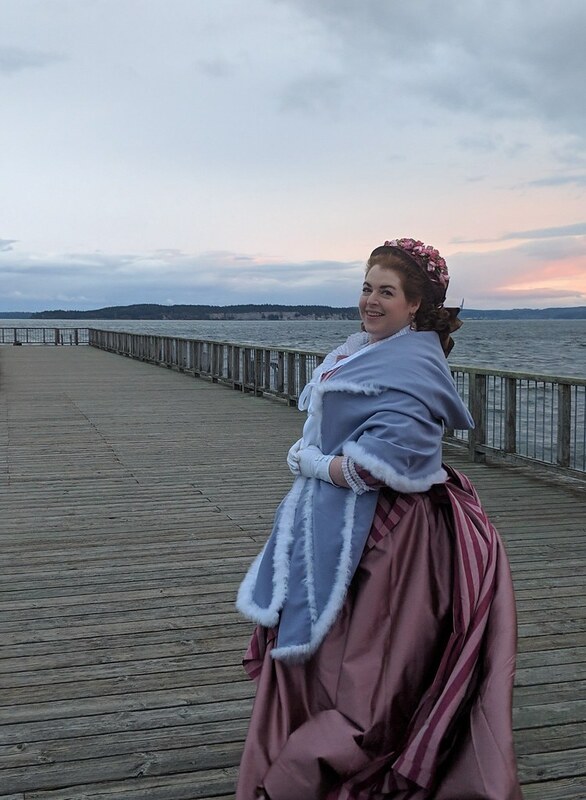 And I pinned my petticoat closed instead of having hooks and eyes, and wound up sewing on the buttons to the plaid dress in my hotel room on Saturday night. But everything else was done, and I even had bonnets/hats for both new looks! I'm also super pleased with how the Fairy Godmother dress came out, and I can't wait to wear it again. Here's a few bonus pictures. I'm still working on editing all the pictures, but they'll be up on Facebook eventually. I got home at about 5pm yesterday, and other than a break for dinner, I pretty much sewed until 10:30, when I forced myself to stop so that I could at least get about 6.5 hrs of sleep. I still have so much to do, though! Make and attach the 3 bows that go on the back of the skirt. Actually, I have to cut out half the pieces for these, too. If time, add a dust ruffle (purchased from aliexpress) to back of hem of FG skirt. Try everything on, do laundry, and pack! I honestly don't think I'm going to be able to finish that all tonight, and I'm hoping to leave at about 10am tomorrow... At the very least, I need to do the closures, stitch together all the bows (I can always pin them in place if need be), add the bustle tapes for the FG skirt, and add the buttons to the plaid skirt. If I run out of time to do hats, I can always just go hatless, and I suppose I can go without the belt, too. And I guess if there's small hand-sewing things to do, I could do them Friday night once I get there. I just hate sewing at events. After my gig yesterday evening, I managed to come home and sew for the rest of the night. Actually, I stayed up way too late, and am regretting that today, but I wanted to get to a good stopping point, and apparently that meant sewing until midnight (and I wake up at 6:25). Anyway, I managed to knock off a fair amount of my list. I started with the day bodice sleeve trim. At this point, it's almost entirely done. One sleeve is 100% done. The other sleeve just needs the lace ruffle sewn in (it's already pinned in place). I also sewed down the lace trim at the back of the neckline. That means all I have left on the day bodice is the lace sleeve ruffle and making and attaching two bows! Then I moved on to the evening bodice. I added the rest of the hooks onto the front closure, so I just need to do bars there. And I figured out my trimming! I took the fine net that is over the sleeves and added a 4" wide ruched section to the bodice front, and then over that is a 2" wide strip that is heavily gathered down the middle. This strip goes all the way around the neckline, curving around to be over the 4" wide net at the bust. This has all been pinned in place, and I started sewing down the 4" strip this morning, though I still have a long way to go on it. Naturally, all of it has to be handsewn. Once that is all done, this bodice just needs a bow at the CF. Go to my instagram for a pic of the evening bodice. Try everything on and pack! Oof. This sleeve trim is so fiddly and time-consuming! It's not that it's hard, it's just that it takes forever. I got all the trim (minus the lace ruffle) completely sewn down on one sleeve. 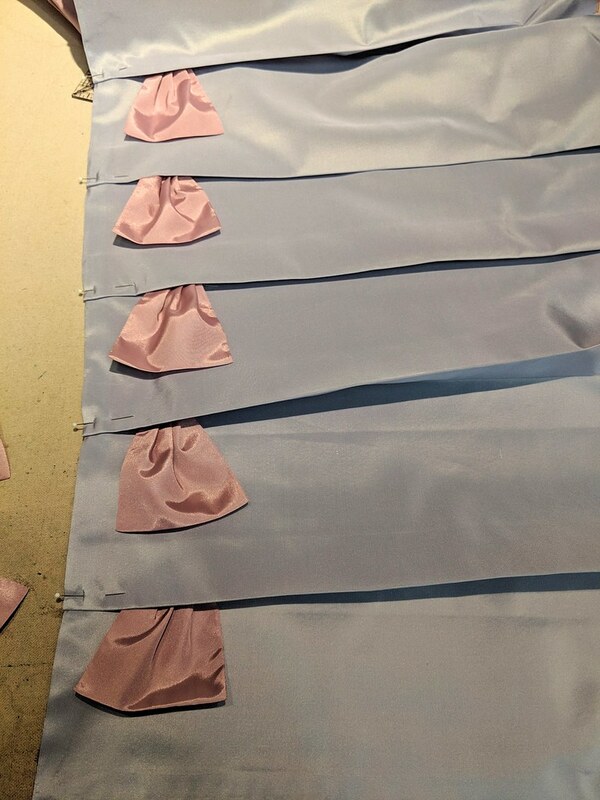 I also prepped all the rest of the half bows for the other sleeve, plus prepped, pleated, and pinned on the pleated section, and prepped (but not pinned) the ruffled part of the other sleeve. There are a total of 62 half bows on this dress, by the way, between the day bodice neckline, sleeves, and the front of the skirt. And each one is sewed down (by machine) inside the pleat, and then has the pleat hand-sewn in place over the half-bow. Have I mentioned I'm terribly slow at hand-sewing? Make and attach the 7 bows that go on FG. Plus two for my shoes if time and fabric allows. Add decorative buttons to the front of the plaid skirt. And probably make a hat for that as well, come to think of it. I have a gig tonight, which will eat out a couple hours of my sewing time, but I still hope to complete all the sleeve trim (including the lace), finish sewing the pleats on the skirt, and finish stitching the neckline lace on the day bodice tonight. Ack! It's really crunch-time now for VicFest sewing, and I still have so much left to do! I got almost no sewing done this weekend, because I spent most of it at Emerald City Comicon. I went the whole day on Friday, leaving the house at about 8:30am, and getting back at about 8:30pm, so I was way too tired to sew after that. Saturday, I spent most of the day cleaning my house, and then had a slightly early birthday party for myself, since I will be in Port Townsend on my actual birthday this Friday. And yesterday I went back to Comicon - mostly for the Rupert Grint panel, but also to take more pictures and see more cosplays (I wore Anna Frozen Fever Friday, and Elizabeth Swann yesterday). I did get a tiny bit of sewing done this weekend, though. Thursday afternoon, I stitched down I think about half of the pleats over the half-bows on the skirt, and added most of the lace trim to the day bodice neckline. And yesterday, I got 5 out of 10 hooks on the front of the evening bodice (I brought sewing to do while waiting for Rupert Grint's panel), and then when I got home, I managed to get the pleated and ruffled sections prepped and pinned onto one of my sleeves. Of course, since I was already tired at that time, I cut them out totally wrong, but I was able to salvage them with small seam allowances. I'm almost out of the pink fabric now, and still have to cut out all my bows, the belt, plus the half-bows for the sleeves. I hope I can make it! So here is my updated to-do list. It doesn't look much different from the last one, especially since I forgot some things on the last one! Stitch down pinned-in-place sleeve trim on FG day bodice. Pray that the rain currently forecast for Friday, and especially for Saturday, goes away. FG is too big to fit under an umbrella! That's a lot to do, and when I type it out it feels even more! Luckily, other than one gig tomorrow night, my evenings are free this week. And I have a feeling I will wind up forgoing the gym on Wed and Thurs, too. My goal for tonight is to completely finish the sleeve trim. Then finish stitching down skirt pleats and the lace trim on the day bodice. I'm exhausted just thinking about it! Naturally, other than the few that wind up on instagram, pictures from both the Outlander Ball and Comicon will be coming after VicFest is over. I've started in on all the hand-sewing I have to do on Fairy Godmother. So far, on the day bodice, I've sewn on all the neckline trim except the lace, plus I did all the hooks and bars. And I finished the sleeve binding on the evening bodice. Bows! I need one for day bodice back, one fo day bodice front, three for the skirt, and one for the evening bodice front. I also have to fix or remake my hairpiece for Anna Frozen Fever for Emerald City Comicon tomorrow, because I'm pretty sure my hair is lighter than that hairpiece right now, despite using the same hair dye. I also need to press my skirt. And Rupert Grint was supposed to be at the con tomorrow, but his panel has been moved to Sunday, so I may attend Sunday as well (for just his panel and possibly a photoshoot). If I do, I'm thinking about wearing Mary Poppins, but that needs a few repairs. Or I might do Elizabeth Swann, since that's ready to go - it's just a harder costume to wear and less recognizable. I wound up not having much time for sewing yesterday, since I was trying to go to bed early (I wound up failing the early part, but at least was on time, which is rare for me). I did, however, finish sewing the binding on the day bodice sleeve hems, and cut the bias strips for the evening bodice binding. And I sewed together, turned, and pressed one of the skirt pleated panels. I was trying to sew just while in the commercials of Jeopardy, so while the show was on, I also pressed my overskirt for Saturday's ball. I still need to press at least the front panel of the petticoat, and figure out my hair, but otherwise I'm set for Saturday. I'm hoping to actually go to bed early tonight (I'm fighting a cold, and I have a singing gig both tomorrow and Friday), so unfortunately may not get much done today either. My goal is to sew and turn the other panel, plus maybe pleat them both, and to get the pink bias binding on the evening bodice neckline. It's a reasonably small enough goal that I think I may actually be able to accomplish it! My extra fabric arrived! I didn't have enough of the blue silk for Fairy Godmother to complete the skirt trim, but luckily, Val is awesome, and picked some up for me when she visited the fabric district last week. And since the 2 yds showed up yesterday, I decided I may as well work on the skirt trim. The other part of that was, I wanted to do the binding for the evening bodice neckline, but before I cut anything on the bias, I needed to know how much of the pink fabric the skirt trim would require. Luckily, I did all the math on the trim a while ago (hopefully it's accurate), so I was able to just rip/cut strips of the blue and of the pink (the blue is backed with the pink. I sewed each color together to get the right length, and pinned the blue to the pink, so that's ready to be sewn, turned, and pressed, before I can pleat it all up. Then I have to make all the little pink fan bits that go inside the pleats. I'm not sure yet how the pleated panels are sewn to the skirt, but will probably wind up having to figure that out by tonight. There's no visible stitching! I've finished the binding on both bodice hems, and I think if I have some time for hand-sewing today, I might start on the hooks for the closures, even though I have to wait for the bars (and I called yesterday, and they're backordered another week! Grr). Because I also sewed in the evening bodice sleeve mockup yesterday, and though I have not tried it on yet, it looks totally wrong! Sigh. I'm hoping it just needs to be turned forward in the armseye, but I guess I'll have to wait till I try it on to find out. I was wrong when I posted last week about what I thought I had already accomplished on the Fairy Godmother bodices. I had only done the day bodice neckline and part of the hem, and nothing else. Whoops. But last night, I finished the day bodice hem and started on the evening bodice hem, and I'm hoping to finish all that handsewing today. I still haven't tested the evening sleeve mockup either. Honestly, I didn't wind up with much sewing time at all this weekend, because I had a lot of house and yardwork to do. The fascia on three corners of my house has started to rot (or two are rotten, one the paint has been peeling on), and I talked to a handyman on Saturday, and he suggested what I could do to protect/fix it, at least for now. So Saturday, I sanded down the fascia in those areas, got rid of the soft wood, and put Minwax wood hardener on them. I also took down all the Christmas lights, and cleaned my front gutter. And had the last performance of my show in the evening. Then yesterday, I put wood filler over all the areas that needed it on the fascia, and managed to clear out about half of a huge shrub that ran the entire length and width of the side of my house, and has been preventing me from doing any maintenance over there at all, including cleaning my gutter. I'm hoping that I can get the rest of it out before more rain comes and before spider season comes, but I filled up my yard waste bin for this week, so it will have to wait till there's more room. And then I went to Applebees and (finally) saw the new How to Train Your Dragon, which left very little time for sewing. What little sewing I did do this weekend was actually mostly spent on altering my 18th c court gown. 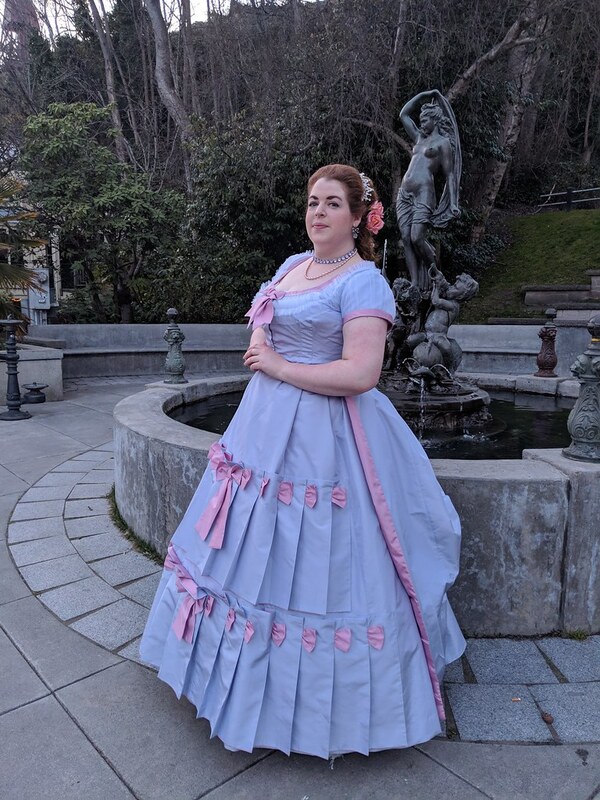 I haven't worn it since CoCo 2014, because a) there's not much that calls for an 18th c court gown, and b) it's so large that I would have to get dressed at the venue. But luckily, there is going to be an Outlander-themed 18th c ball this Saturday at a country club with dressing rooms! And also luckily, I pulled it out a week ahead of time to make sure that it still fit. Because... it didn't. Although I was eventually able to lace my stays tightly enough to get it closed, it was so tight that I had a minor panic attack when I tried to get out of it (the hooks and eyes refused to unhook, and I wound up literally removing three of the hooks with my seam ripper to get out of it). It was much more comfortable when it opened up to about 2.5" or so at the bust (the waist still fits, oddly enough). Luckily, it's the 18th c, so I decided I would just add a stomacher to make it work, and also luckily, I pretty much had just enough fabric left to make one. So Friday and Saturday's little bit of sewing time was spent making a boned stomacher with four frilly bows, which will pin in to the bodice to close it. Success! Now all I'll have to do is press the whole gown, and figure out my hair (my wig is way too uncomfortable to wear again). Thankfully, my evenings this week are fairly open, so I think I should be able to both a) go to the gym multiple times, and b) knock out a bunch on the Fairy Godmother bodices. Though at this point, I don't think there's enough time left to squeeze in the Daniel Deronda riding habit before VicFest, too! I also decided I'm sick of spending way too much money on buying hooks and bars from Joanns, so I ordered a great gross of silver size 2 hooksfrom Richard the Thread. I have four gross spoken for already, but if anyone wants to buy a gross from me, I'm selling them for about $10 + shipping. I'll know the exact price once I get the final invoice from Richard the Thread. Let me know if you want a gross or two from me. 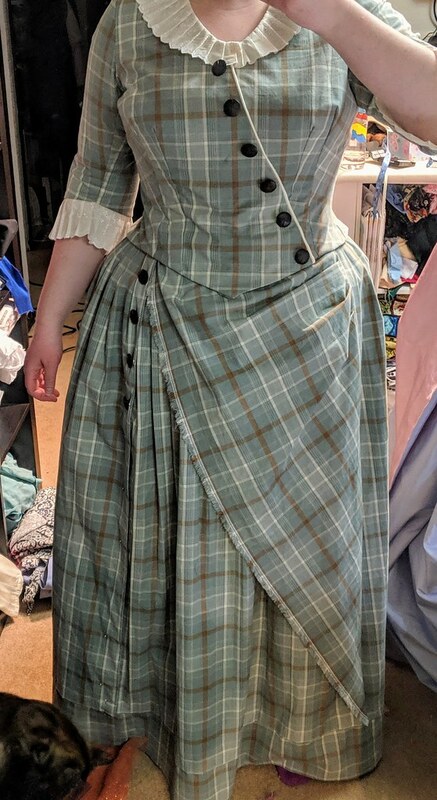 Apparently, I never posted here about the really stupid mistake I made in my plaid bustle, which I naturally only found out about after it was all 99.9% finished. 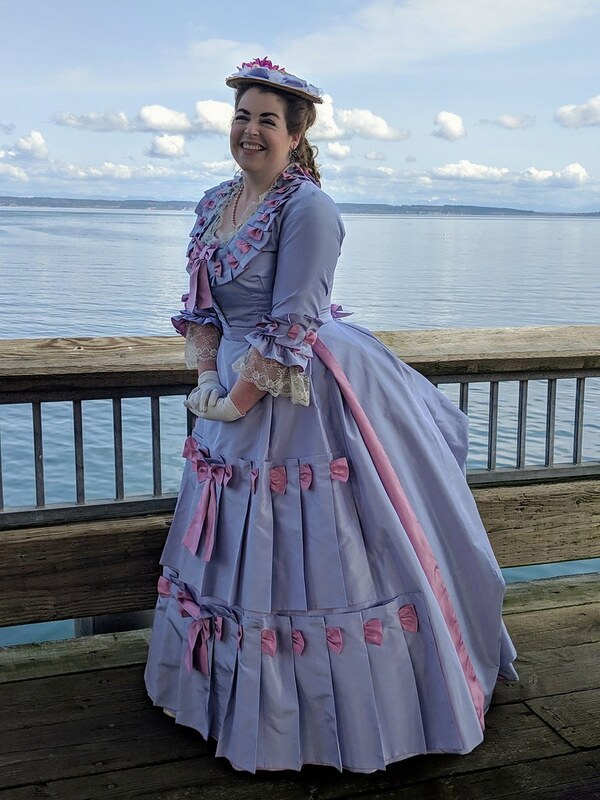 You've heard this story if you saw it on Facebook or Instagram, but for those who didn't see it, I realized when I went to go put the buttons on my skirt that I made the bodice entirely in reverse of the fashion plate. Of course, the bodice is 100% finished, so there's no way I'm redoing it. The skirt is 100% finished other than those decorative buttons, but I could still potentially rip out the front asymmetrical panel and the waistband, flip the panel (since the fabric is double sided), and redo the waistband. 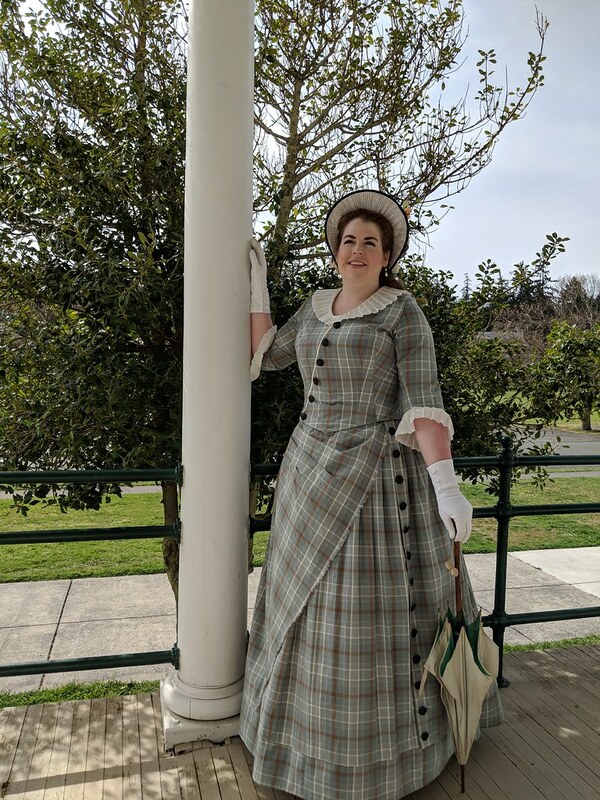 But, since I have the whole Fairy Godmother project still in progress, and I'm hoping to make the Daniel Deronda riding habit by VicFest as well, I'm back-burnering the plaid dress until I finish the others. If it comes down to it, I will put the skirt buttons on the opposite side from where they should meet the bodice buttons. I tried it on, and while I don't like it as much, and it's not to the plate, I don't hate it. In the meantime, I didn't work as much on the Fairy Godmother as I wanted this last week, but I at least got some done. I now have both the evening and day bodices assembled. The day bodice has sleeves that I'm about 85-90% happy with (which is as good as it's going to get with my level of patience), and both bodices have the front edges finished, though without closures. I need to pick up bias tape for the neckline and hems, since I don't have enough fabric to do self-bias. And I have a sleeve mockup for the evening bodice that I need to try out. Then it will be on to trimming and closures. My buttons finally arrived! I put the two I needed for the bodice on already, and I'm hoping to get all the skirt ones done today, too. Because then my plaid bustle will finally be done. I had about an hour for sewing yesterday, and decided to spend that on fitting my sleeve on the Fairy Godmother bodice. What I finally came up with is such a weird shape. I don't know if my armseye is a strange shape, or if I just don't understand fitted sleeves, or what. I think I'm actually going to test it one more time, now that I've cut off the excess, and make sure it still fits right. That's my other goal for today - finish the sleeve mockup, and get the actual sleeves cut out and set. And go to the gym, since I haven't done that in a couple weeks. And do laundry. If I manage all that, then maybe I can start on bodice finishing, too, since I don't have anything else going on tonight. The plaid bodice is still in its almost-finished stage. I bought the bars and put them on (while sitting in the Joanns parking lot) on Thursday, but the buttons that were supposed to arrive Friday have still not arrived. Supposedly they will now arrive today. In the meantime, I started working on the Fairy Godmother bodice. I started with my standard Victorian bodice block, which has a six-piece back, and altered it to have three pieces, because the seam lines on the extant bodice are really obvious. And miraculously, I altered it correctly into the mock-up, and it fit perfectly! I also dropped the armseye about .5" since this is 1870. And I opened the neckline a little bit. It was nice that it fit so well. I'm going to use the same pattern for the evening bodice, just with the evening neckline, even though the extant one only has one dart on each side in the front (and there's no pictures of the back). So anyway, I cut out the silk for the day bodice, flatlined it with the mockup pieces, and assembled it. Yesterday, I mocked up the sleeve, attempting to turn my two-piece into a one-piece, and naturally, re-inventing the wheel in the process. I'm sure I could have just started with any old one-piece sleeve instead. I have yet to set the mockup, but that will be my next step. I also cut out the twill layer for the evening bodice, but have yet to cut the silk yet. Once I cut out the day sleeves, I'll cut the silk for the evening bodice.